Provasi is the expression of elegance in the furniture and it’s greatly pursued thanks to the strenuous researches of Technical and Style Offices of the company, providing high quality materials, from wood to fabrics, to finishes. The headquarter is in Seregno and develops itself on a 10.000 sqm surface, where groundbreaking production spaces alternate with Design, Research and Style Offices, as well as with an important showroom that offers a reproduction of the most distinctive ambiances created by the Company throughout the years and can be personally visited by appointment only. 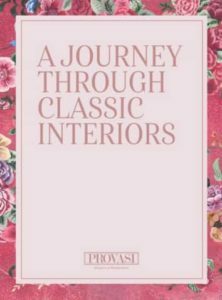 In the last 20 years, the Provasi range of products has evolved and transformed, chasing the changes of classic furniture taste in Italy and in the whole world. An internationalization that has provided softer lines, lighter woods, directing itself towards a sober and good taste allure. NEED MORE PROVASI INFORMATION ?